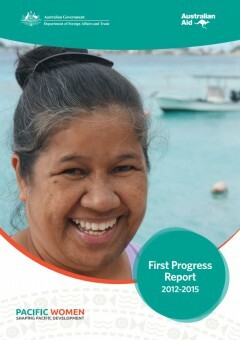 This is the First Progress Report of Pacific Women, which provides a snapshot of the program’s achievements and challenges in its first three years of operation. All 14 Pacific Islands Forum countries have received some form of support through Pacific Women. Since its inception in 2012, Pacific Women has supported 12,897 women and girls to access crisis support services, 1,716 women to undertake financial literacy training and 563 women obtain formal qualifications. The inaugural report showcases some of the 90 activities that have been implemented across 14 Pacific Island countries in partnership with Pacific governments and communities as well as multilateral and regional organisations. The report was launched in December 2015 by the Hon Steven Ciobo, Australia’s (former) Minister for International Development and the Pacific, and the Pacific Islands Forum Secretariat Deputy Secretary General and Pacific Women Advisory Board Member, Ms Andie Fong Toy.